This past April 4, 2018, yours truly had the honor to introduce and chat with the poetic storyteller Shanthi Sekaran about her new novel Lucky Boy. Sekaran is currently the 2018 Distinguished Visiting Writer in Fiction and Creative Nonfiction in the MFA Program in Creative Writing at Saint Mary’s College, and her work includesThe Prayer Room. Lucky Boy is the tale of two women who’s lives are forever linked by love and loss. The video of her reading and our Q&A is now up as part of SMC MFA Creative Reading Series, so you can see for yourself the brilliance of Sekaran. Please treat yourself and share with other lovers of word and story. Students in yours truly Jan Term course “The Art of Race: (Re) Imagining Ethnicity, Race, and Identity in Literature, Art, & Pop Culture” are working hard on their final project, which is a creative writing assignment to write poetry, short fiction, or a personal essay inspired by the artists, writers, musicians, and theorists we’ve studied on how race, ethnicity, gender and sexuality inspire and shape creative work and how the different forms of art can redefine and interrogate notions of race, ethnicity, gender, and sexuality. 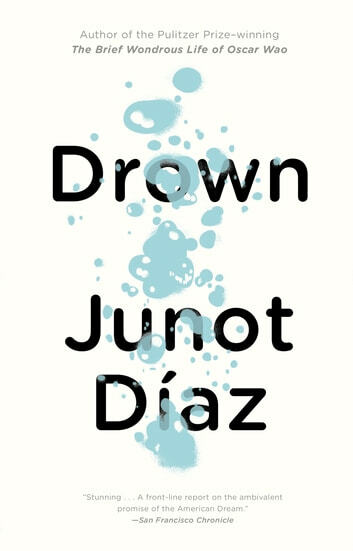 We’re ending the term by looking at Junot Diaz’s Drown and his MFA vs. POC written originally for Dismantle: An Anthology of Writing for VONA workshops and later published by The New Yorker. The students have really responded to and ran with the prompts we’ve been working with and requested a third and final prompt, which I’ve included below for you to have a go if you so choose. Create a list of fifteen items, including objects, images, songs, movies, TV shows, magazines, albums, clothing, jewelry, toys, household items, etc. that remind you of your childhood. Don’t edit or over-think but try to list as many items that represent your childhood and adolescence then chose two or three and write about them in as full description as you can. What do they look like? What colors? What do they smell like? What do they sound like? What are the textures? Where are they soft? Scratchy? Smooth? Bumpy? What did it feel like to hold them? What kind of feelings surfaced when you engaged with them? Where did they come from? Who gave them to you? Do you remember when you first received them or noticed them? What kind of memories are they attached to? What kind of wonder do they spark? Examine each carefully as if it were a precious stone or a sacred relic. How would you describe them to someone who couldn’t see and who didn’t know what your childhood meant to you? Taking a cue from both Junot Diaz and Barbara Jane Reyes, recall work day mornings with your parents or guardians and write a description of their morning ritual before leaving for work. What did s/he wear for work (tie, heels, uniform, cuff-links)? How did s/he prepare in the morning? What kind of ritual did s/he practice? Hurried? Slow paced? Make breakfast? Rush out the door before you were awake? What kind of expression did s/he usually have? Worried? Tired? Excited? What did s/he take with him to work (briefcase, purse, coffee mug, water bottle, packed lunch)? Did you have time to talk with your parent or guardian before you both left for school or work? What did you usually talk about? Was there a specific memorable morning you shared together, and if so, what made it memorable? Conversely, recall the evenings or afternoons when your parent/guardian returned from work? What hour? Was s/he tired? Did s/he need time alone to decompress? Did s/he start cooking dinner immediately? What was the ritual returning from work? Inspired by Junot Diaz, pick a memorable moment with a significant other or close friend and recreate the details of that moment. What time of day? Where were you? What where you both wearing? What was the weather like? What time of year? Who else was there? What were they saying? What were they doing? What was the dialogue between you and your significant other? What kind of tension were you facing together? What kind of tension were you both facing individually? What were your fears at the time? What were your hopes? What were your significant other’s fears and hopes? How did his/her fears and hopes conflict with yours? How did they coincide? Now twist the moment. How would it have gone differently if you said something opposite to what you actually said or did something opposite to what you actually did? Would you still be together as friends or partners? How would you have fractured or mended the relationship? How would you have complicated or simplified the moment? Written language seems to me a landscape. Land bound in words. I pick up stones or rocks in travel as texts I can read. There is a map you open like a book. There are books you open like a map. There is a map you decide to call a book? A book of the territories you’ve traveled. A book of the in-between places you’ve lived. A map is a meaning you hold against the unknowing. The places you speak in many directions. The below prompts are inspired by Glancy, Reyes, and Soto Roman. Have a try for yourself! What song/lyric/commercial/dialogue from TV or movie is stuck in your head? Look it up, so you can accurately quote, if you need to. How is this found text related to what you are feeling right now? How does it give insight or confuse or challenge your emotions or your thoughts? How is it related to something your mother/grandfather/brother/partner/friend/roommate once said or always says? Take one of the words and create a new line, phrase, or dialogue to spin it your own way. What historical event, book, movie, TV show, physical landmark, specific place anchors your sense of self? Do some research on this anchor. What is its history? How did it come about? How does its story of evolution give insight into your (d)evolution? How did you first learn about this anchor? Who introduced it to you? When? Why? How do you feel about this anchor now? Does it root you or shackle you? How do you claim it as your own or how does it claim you? Make a list of your fears and superstitions. Then add fears and superstitions that you know of from close friends or family. Close your eyes. Circle one of them. Whichever one you circled, have your main character confront that fear or superstition. Where are they? What are they feeling? What are they thinking? What physical sensations are they experiencing? Are they alone? Is anyone else there? If so, what are they doing? How are they helping or hindering? What do they say that worsens the situation? How does your main character fight back? How does fighting back make matters worse? By the end of the term, I like to believe I will be ground down to an essence in which I could be sprinkled into a tasty mole. We are moving into the final project for the course where students will choose a creative writing genre (poetry, short fiction, or the creative personal essay) to write their own story of race, identity, ethnicity, multiculturalism, difference, prejudice, and/or discrimination. In addition to the basic principles of their chosen literary form, they are expected to incorporate ideas and creative analyses based on the authors we’ve read in class to creatively interrogate notions on how issues of race, identity, multiculturalism, difference, and prejudice intersect with imagination, literary style, and aesthetics. Taking a cue from Barbara Jane Reyes poem “The Day” in Invocation to Daughters (City Lights, 2017) write about this specific moment. Note the time, the date, the location, and describe details of this particular moment for each of the seven senses (sight, sound, taste, touch, scent, balance). Note your surroundings. Where and how are you physically? How does that contrast or coincide with where and how you are mentally, emotionally, spiritually, artistically. Taking a cue from Kevin Young The Gray Album: On the Blackness of Blackness, What keeps you up at night? What gets you out of bed? Who is your imaginary “American”? Where does s/he come from? Describe the land? Use your senses, touch, smell, taste, see, hear, balance? What does s/he wear? Eat? How does s/he walk? Talk? How does s/he roll? What does s/he rock to or listen to? How does that music make him/her feel? What is his/her American dream? Create a scene where a character first discovers s/he is different from others. Where does this scene take place? Who else is there? What are they doing? Wearing? How are they acting? How do the other characters create or take away space from your main character? How do the other characters create a mirror for the main character to see him or herself reflected? How does s/he react to his/her own self image reflected back? What kind of conflict and tension is created? Is there an exchange through words or action? How does the exchange or non-exchange heighten the interiority of tension your main character is feeling? What differences does s/he notice between her/him and the other characters? How does that affect the six senses s/he is feeling at the moment (sight, sound, taste, touch, scent, balance, and time)? What questions are raised for your main character? 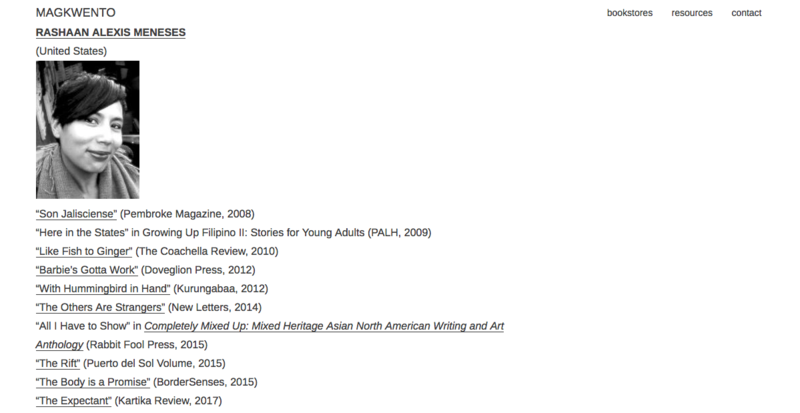 Yours truly is thrilled to have just confirmed three brilliant artists as guest speakers to visit my Saint Mary’s College of California’s Jan Term 043-01 course “The Art of Race: (Re) Imagining Ethnicity, Race, and Identity in Literature, Art, & Pop Culture. Each of these artists have recently released new work, which I have no doubt will engage and inspire my students. Our second guest speaker is long time friend and deeply inspiring poet, professor, and community advocate (I owe so much to her! ), Barbara Jane Reyes, who will be visiting our class on campus to discuss her new book just released from City Lights, Invocation to Daughters. Have a taste of her words here, courtesy of Poetry Foundation. Our third guest speaker, who will round at our term is long time fellow Angelena, who I met lifetimes ago at the L.A. based Wide Eyed Workshops, musician and artist Marjorie Light. 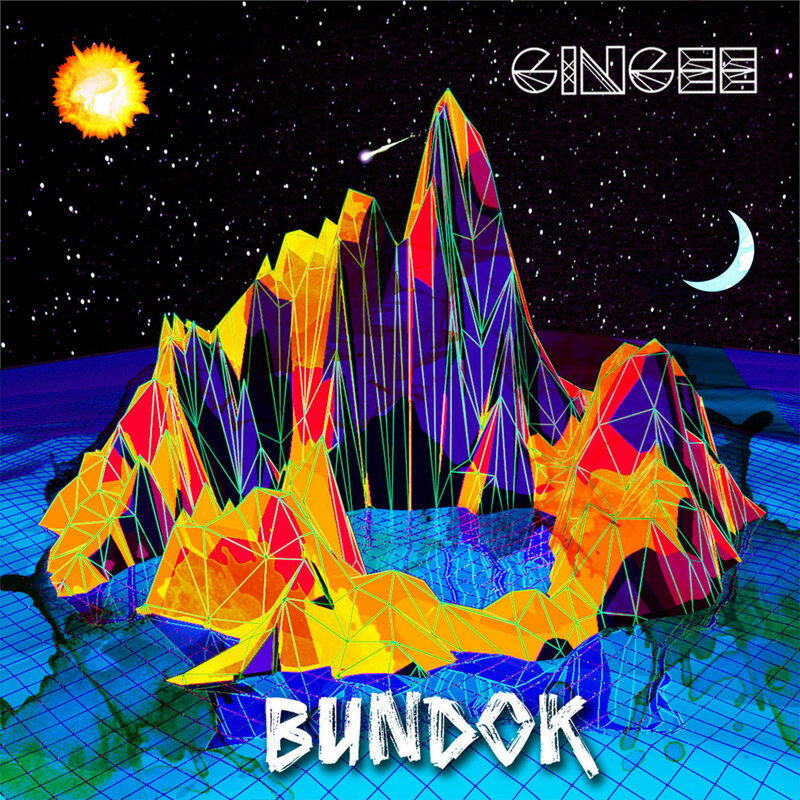 Video conferencing from the City of Angels, Light just released her latest album Bundok. 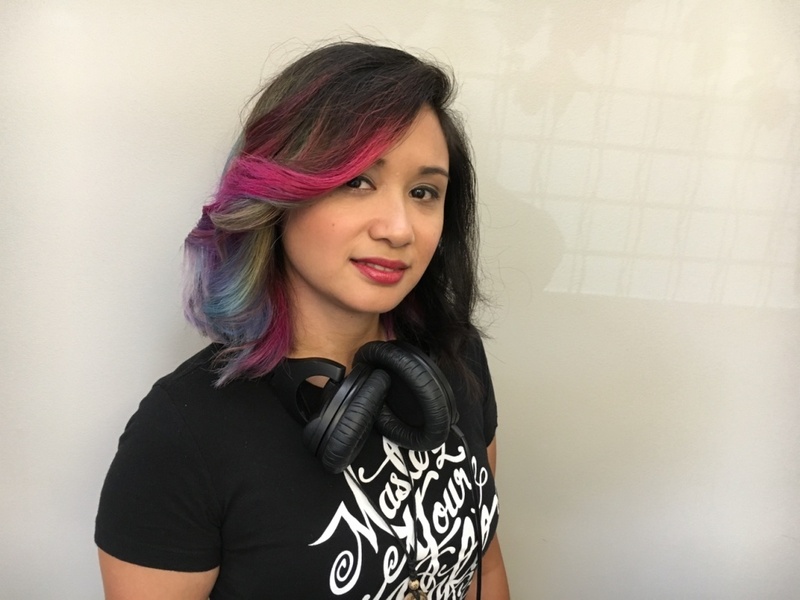 Give your self an aural treat of her latest tracks here and find out more about her work with KCET’s feature article. I also need to give a shout out to all the crew of SMC’s ITS who have been working with me to get all the tech ready for the video conferencing to Santiago, Chile, and Los Angeles, CA. Fingers crossed that all the equipment and connections sync for the big dates! 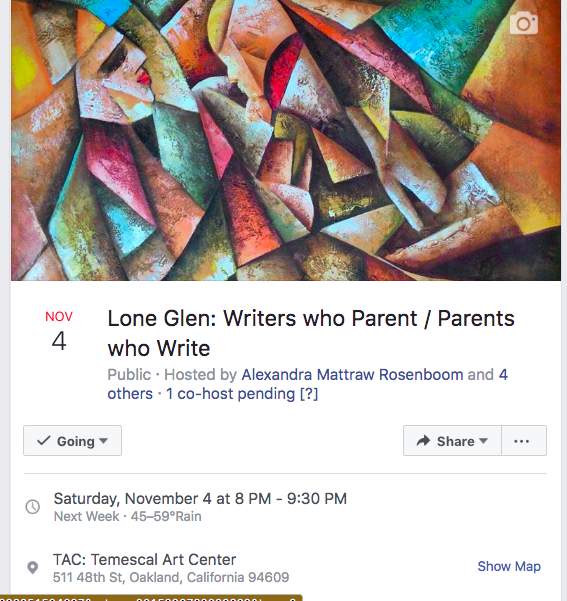 Organized by poet and educator Alexandra Mattraw Rosenboom , we invite you to join us at Lone Glen: “Writers who Parent/ Parents who Write” on Saturday, November 4th at 8 pm at Temescal Art Center in Oakland (511 48th Street) to hear work from Megan Breiseth, Lauren Levin, Rashaan Alexis Meneses, Sara Mumolo, and Amos White. In our community, what role does parenting play in the creative process, and what role does the imagination play in the journey of raising a child? 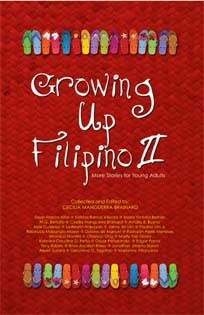 How does the act of parenting serve as a constraint, or not, as we express ourselves in writing and in other art forms? Come out to hear what these parent writers are thinking about in their work and about their process. A brief Q and A will follow their readings. Megan Breiseth is the author of the chapbook Zia (Mrs. Maybe Press), co-author of the chapbook the longer you stay here (Aggregate Space Gallery) and two manuscripts-in-progress. She works as an educator and lives in Alameda, CA with her wife, son, and cats. Lauren Levin is the author of THE BRAID (Krupskaya, 2016) and the forthcoming JUSTICE PIECE/TRANSMISSION (Timeless, Infinite Light, 2018) as well as several chapbooks, including The Lens (Little Red Leaves, 2014) and Working (Portable Press at Yo-Yo Labs, 2012). 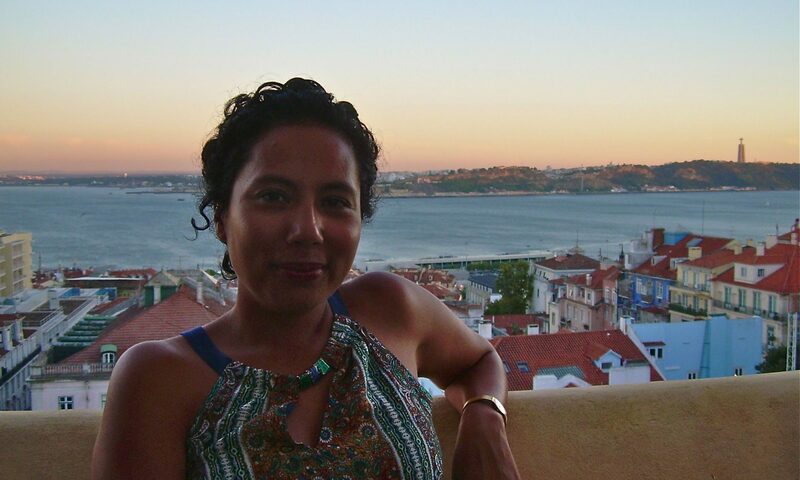 From 2011-2014, she co–edited the Poetic Labor Project. She grew up in New Orleans and lives in Richmond, CA with her family. Sara Mumolo is the author of Mortar (Omnidawn, 2013) and the Associate Director for the MFA in Creative Writing at Saint Mary’s College of CA. She created and curated the Studio One Reading Series in Oakland, CA from 2007-2012, and Cannibal Books published her chapbook, March, in 2011. She has received residencies to Vermont Studio Center, Caldera Center for the Arts, and has served as a curatorial resident at Pro Arts Gallery in Oakland, CA. Her next book Day Counter is forthcoming in 2018 from Omnidawn.